JHBONLINE.NET EXCLUSIVE 2011 "STARS ON ICE" BACKSTAGE PHOTOS HERE! FIRST NEW "KURT & ME" IN 6 YEARS! TORONTO - The elimination-style reality show "Battle of the Blades" will skate another season. CBC says its celebrity-packed hit series will return next fall with another round of figure-skating competition. Former Canadian figure skating champion Kurt Browning will host Canada's Walk of Fame gala in September, the annual induction of new Canadian celebrities into the Toronto-based Walk of Fame. Kurt Browning and his wife, Sonia Rodriguez, are thrilled to announce the birth of their son, Dillon, born Tuesday, August 14, 2007 in Toronto, weighing seven pounds. The couple’s first-born son, Gabriel, is equally excited and is already enjoying his new role as Dillon’s big brother. Kurt will take to the ice again in October for ‘Kurt Browning’s Gotta Skate’ show on October 10 at the Hershey Centre in Mississauga before he joins the cast of Stars on Ice for his 17th tour across Canada in April, 2008. He is was inducted into the World Figure Skating Hall of Fame in March 2006 during the World Championships in Calgary. 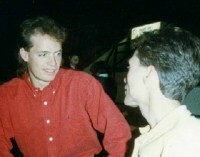 For those of you who don't know and just surfed on in, Kurt Browning is a four-time Canadian and World Figure Skating Champion (1989-91, '93). He has been credited by the International Skating Union (ISU) with completing the first quadruple jump (a toe loop) in competition at the 1988 World Figure Skating Championships in Budapest, Hungary (where we met, see below) and is listed in; the Guinness Book of World Records for this achievement. A%203-three%20time%20Olympian%20(1988,' 92 &?94), he carried Canada?s flag Opening Ceremonies 1994!Kurt also won World Titles (1995-97) three times each in 1998 added a second US Pro and the inaugural Canadian Open Championships to his impressive resume. (12/15/05) - World Figure Skating Museum & Hall of Fame President Hugh C. Graham, Jr. M.D. announced today the 2006 elections of Kurt Browning of Canada and Frank J. Zamboni of the United States to the World Figure Skating Hall of Fame. Zamboni (posthumously) and Browning will be inducted during the 2006 World Championships in Calgary, Alberta, Canada, in March. Browning's amateur career included four Canadian men's titles and four World titles. He was the first Canadian man to win three consecutive World titles (1989, 1990 and 1991). Browning earned the distinction of winning the most championship titles by a Canadian singles skater with his combined four World titles. Browning also was a three-time Olympic team member. At the 1988 World Figure Skating Championships in Budapest, Hungary, Browning made history by being the first man to land a quadruple jump (toe loop) at a World Championship. In addition to jumping records, Browning's trademark has been his incredibly fast footwork and interpretive skating, such as his Casablanca routine at the 1993 World Championships. After retiring from eligible skating in 1994, Browning, a native of Caroline, Alberta, won three World Professional Championships. He has continued to remain active in figure skating as a choreographer and sports commentator. Born on June 18, 1966, Browning was inducted into the Canadian Sports Hall of Fame in 1994 and Skate Canada Hall of Fame in 2000. His charitable work includes being the creator and sponsor of the Kurt Browning Junior Skating Awards. Browning is also the author of "Forcing the Edge" with Neil Stevens and his children's book, "A is for Axel: An Ice Skating Alphabet." Ross Petty Productions Presents Kurt Browning in Peter Pan Annual family musicals presented at the Elgin Theatre in Toronto. View past season, current events, and history. Marsha and I did get to see Peter Pan and were as always amazed at the talent of Kurt Browning. He sang and danced very well....and of course suited the part of Peter Pan to a tee and having his natural comedic ability adlibbed lots. Near the end he comes out on stage on roller blades and astounds everyone with his moves...quite different from ice skates actually and boy could he move. At the end he did a sixtet spin but of course had his flying wires on at the time!!! He did make an aside about "where were they in the Olympics!" Kurt is now a Children's book author!!! Order "A is for Axel: A Skating Alphabet" HERE NOW!!!!!!! Royal Bank From Child to Champ featured the skating career of four time champion Kurt Browning. The exhibit was part of the "Feel the Spirit Festival", which was the Cultural Component of the World Figure Skating Championships being held in Edmonton during March 1996. The exhibit focused on the life of a figure skater - the early mornings, sprained ankles, tears and, for Kurt Browning, the triumph. Medals, costumes, skates and memorabilia from Kurt's personal collection were on display as well as his treasured commemorative medal and the touching story behind its creation. A short film, from Aquilla Productions, featuring the changes that have taken place in competitive skating, and an interview with Kurt; the struggles and the highlights of his career, his pursuit for excellence and his initiative in developing new and unusual combinations of jumps, were presented. Some remarkable moments in Figure Skating history have been captured by photographer, Paul Horvath. More than 30 photographs, spanning a twelve year period were on exhibit, from the World Figure Skating Museum and Hall of Fame in Colorado Springs. KURT BROWNING was born in Rocky Mountain House, Alberta, Canada to parents, Dewey and the late Neva Browning, on June 18, 1966. He has an older brother, Wade Browning and an older sister, Deana Browning-Miller. He is also a 3-time Canadian and World Professional Champion, and he has twice won the US Pro Classic and was the winner of the inagural Canadian Open Championship. A 3-time Olympian (1988,1992 & 1994), Kurt was given the privilege of carrying the Canadian Flag into Opening Ceremonies in Lillehammer, Norway in 1994. Kurt has received his country's highest civilian honor, the Order of Canada. He has twice been named Canadian Athlete of the Year and has been inducted into Canada's Sports Hall of Fame. He was also elected to the Canadian Figure Skating Hall of Fame in 1999, and inducted in 2000. The skater has been featured in the following home videos: "JUMP!" "INSIGHTS INTO CANADA'S GREATEST SKATING STARS", "GET WHAT YOU NEED!" and "LIFE AFTER HOCKEY". Kurt was also the subject of "A LIFE ON THE EDGE," a documentary by the National Film Board of Canada. On June 30, 1996 he married SONIA RODRIGUEZ, a principal dancer with the National Ballet of Canada. He proposed to Ms. Rodriguez, during a 1995 Stars On Ice performance in Toronto. The couple has two sons, Gabriel, born July 12, 2003; and Dillon, born August 14, 2007. On June 19, 1998, Mr. Browning received the Jacques Favart Trophy, the highest honor awarded by the International Skating Union, and received a star on "Canada's Walk of Fame in June 2001, after co-hosting the ceremonies the previous year. ...and has also represented the Muscular Dystrophy Association. Kurt appeared on a poster for the Canadian School Library Association's "Champions Read" Series. And has worked recently with Investors Group of Canada on a fund for young skaters. He has toured with "Stars On Ice" and "Tom Collins Tour of Champions" (now "Champions on Ice"). As a fashion model, Kurt has appeared in print ads and catalog layouts for Eatons department stores in 1994 and in a muti-page spread for Wedding Bells Magazine (with wife, Sonia Rodriguez). Having served as commentator for CBC, NBC, and FOX, and most recently ABC/ESPN (debuting in 2005-06 season) television networks, Kurt has starred in his own TV specials: "Tall In The Saddle", Kurt Browning: By Request "You Must Remember This", the winner of 5 Gemini Awards, including "Best Variety Special" and most recently "Gotta Dance" (aka: "Gotta Skate") in December 2001, a series of annual sequels have followed. "Gotta Skate # 6.0" aired December 17, 2006 on NBC. Kurt participated on Fox-TV's reality series, "Skating With Celebrites" in 2006. He was also the title character in "Disneys Aladdin On Ice" TV Special (co-starring Kristi Yamaguchi) and has been featured in the first 2 "Snowden On Ice" shows, as well as having guest starred on the specials of Scott Hamilton ("Upside Down") and Tara Lipinski's "From This Moment" and "Hip Hop On Ice", and the TV series, "Ready or Not". More recently, he hosted a segment of "100 Years of Canadian Sport" (AKA:"Kurt Browning: Ice Legends" on TSN, and contributed to A&E's Biography of Scott Hamilton as well as "Scott Hamilton: The E! True Hollywood Story." Kurt has served as a regular host for Biography Channel: Canada.KURT appeared with fellow Stars On Ice cast members on FAMILY FEUD Feb. 16-20, 2004, and also narrated the DVD "Lipton's Light Hearted Moments (of Stars on Ice: Canada) that same year. He made his Toronto-area theatrical debut in "Peter Pan" during the Fall of 2007. And Co-Hosted CBC's "Battle of the Blades" in 2009 and ABC's "Thin Ice" in 2010. He has recently begun a career as a choreographer with "Stars On Ice," as well as contributing to programs for Olympic Champions, Tara Lipinski, Jamie Sale & David Pelletier; as well as 2002 & 2003 World Bronze Medalist, Takeshi Honda, as well as European champ, Brian Joubert of France; and World Medalist Evan Lysacek (USA). Kurt was the subject of a clue on Jeopardy!, September 17 or 18, 1999. (Date dependent on weather on not Monday Night Football airs in that time slot in your area. )Kurt also received a mention on the TV series, Due South (TNT airdate: September 29, 1999). Fraser, Sr.: "You never appreciate life until your dead! One of the Brownings said that Kurt or Robert"
he was featured in Ontario Golf Magazine in 2000. Gabe @ age 1 yr.. Led World Team to Victory: Top Mens Score in both programs. 1999 elected to Canadian Figure Skating Hall of Fame: Inducted January 30, 2000. 2000 named second most popular athlete of the century in a CBC poll of his fellow Canadians. June 1,2001: receives "star" on Canada's "Walk of Fame." 2001:Kurt received the Gustave Lussi Award from the Professional Skaters' Association. Congratulations Kurt! February 24, 2002: Featured performer at Closing Ceremony of Olympic Winter Games in Salt Lake City. Appeared on "Family Feud: Stars on Ice edition in February 2004 and February 2005.